Electricity emitting from the coil on the left is powering the 60 watt lightbulb attached to the coil on the right. 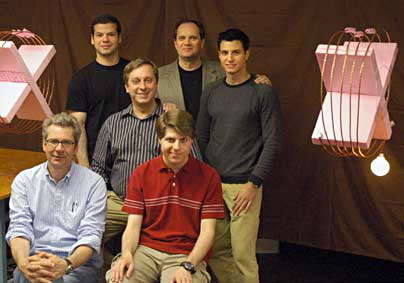 Researchers: (front row) Peter Fisher (left) and Robert Moffatt; (second row) Marin Soljacic; (third row) Andre Kurs (left), John Joannopoulos and Aristeidis Karalis. Imagine one day no longer needing to plug in your cell phone or laptop to charge up. Simply walk into a room and all your electronic devices will recharge automatically, drawing electricity seemingly from the air itself. Massachusetts Institute of Technology researchers have sussed out a way to transmit power wirelessly. The work was funded by the Army Research Office (through the Institute for Soldier Nanotechnologies), the National Science Foundation and the Department of Energy. While transmitting electricity sans wires has been done before, such methods leaked so much power in transit as to make the process useless for practical use. The new work promises a dramatic improvement in performance. In the June 7 issue of Science, these researchers reported to have transmitted 60 watts over a distance of two meters with 40 percent efficiency. The trick? Something called magnetically-coupled resonance. The experimenters used two large copper coils. One coil was attached to a power source and radiated the power in a specific frequency. The other coil, the receiving unit, was tuned to pick up power at that frequency. Because the two units were in resonance, much more power could transferred--and transferred over greater distances--than could be moved by standard induction. "Two resonant objects of the same resonant frequency tend to exchange energy efficiently, while interacting weakly with extraneous off-resonant objects," the announcement noted. Evidently, this approach works best for small distances, say the length of a single room of so. Judging from the photo supplied by M.I.T., the coils that were used are obviously too bulky to be placed in rooms, much less than to be squeezed on your Blackberry. But the proof of concept has been laid out, and if this technique can be scaled to workable proportions, we can all feel a little foolish for not thinking of this simple form of power conveyance sooner.